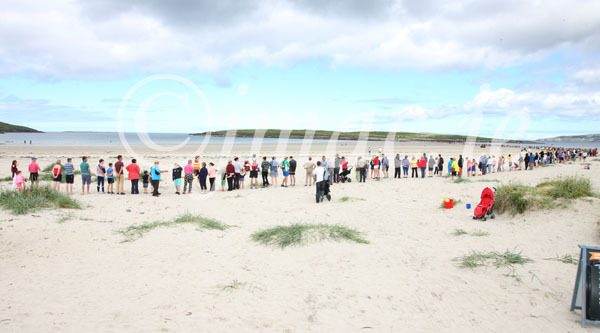 The Dolmen Centre would like to thank all those who participated in their ‘Hands across the Sands’ event on Monday last. A crowd of well over 1,000 people joined hands from the beach front all the way to Inniskeel island, to help raise funds for the provision of a public Swimming Pool at the Dolmen Centre. Blessed by the weather, the large crowd were in a festive mood and a wonderful family day out was added to musically, by the Ryan brothers (Tony & Seamus). A well attended BBQ, staffed by an army of helpful Volunteers, fed the hungry hordes that descended, once the goal of reaching the island was attained. A sold out raffle, saw numerous prizes offered and there were many happy winners on the day. Patsy Harkin, Chairperson of the Dolmen Committee thanked the many Sponsors of the event, the participants, Volunteers and in particular Michael John Nicholson, whose brainchild, the event was. As this goes to press, the event has raised over €8,000 which will go towards the local contribution should the project receive grant aid. Once again a massive thank you to all who helped in any way either on the day, or in the lead up to the event. You can be truly proud of your achievment.